When it comes to car maintenance, there’s a lot more involved than washing and waxing. Car detailing services offer a wide variety of auto practices that ensure only the best cleaning and protection for your vehicle. Complete detailing services are not only limited to cars but are also open to wider varieties of transport, whether they are used on land, sea, or air. Some people might think that detailing is only for avid auto-enthusiasts, but an ordinary car owner like you can reap as many benefits. By getting a car detailed, you are making sure that it looks good, is well-protected, and can perform better for longer. Know more about auto detailing services below. When it comes to the type of auto detailing services, there’s a long list of what you can avail. From more specialized vehicles like motorcycle detailing to specific parts of the car, you need to know the basics of each to get the most out of these services. A regular detail service can be divided into two: the interior package and exterior package. 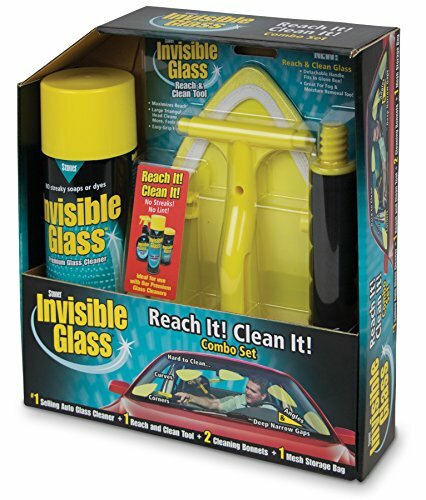 Both packages tackle the different needs your car’s inside and outside might have. You can also ask for a complete or full detail which is the combination of both. If you’re looking for maximum protection, there are also many add-ons you can avail. First thing first, let’s start by looking at some of the famous products use by the professionals for automobile care. What does detailing a car mean? What does a car detailer do? How to detail a car? How much do you need to detail a car? Now that you know how to detail a car and the other basic information about an auto detailing service, it’s time to talk about the best products to help you do a great job. Not all products have the same quality, whether it be judged by their performance or how environmentally safe they are. When you want to take on this kind of automotive project, finding the best car detailing kit is a must. Just remember that it isn’t necessary to get the most professional car detailing kit if it doesn’t fit your needs. When you search the internet, you will find many articles naming the best car waxes and car polishes to use when detailing, but like discussed the service isn’t just about those two steps. Here are seven great products that have different functions and can still immensely help you with your project. 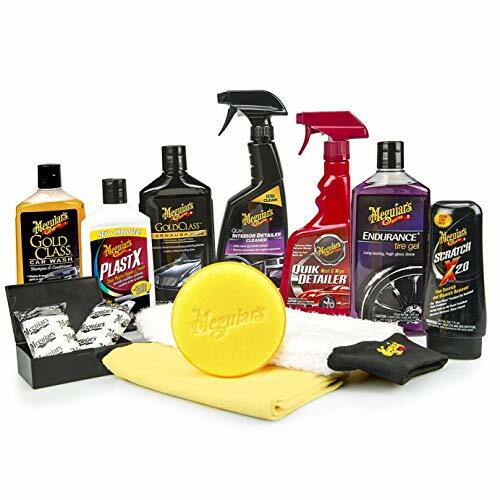 If you don’t want to spend your time looking for each individual product you’ll need to get your car thoroughly clean, then it might be best to get a complete car care kit like this. The advantage of buying a kit with multiple products and accessories included is that you don’t need to guess which product would work best with each other. Plus, Meguiar’s is a brand that has been a cult classic for many years. They have proven time and time again that their products are not only formulated to be top-notch but also give stunning results as well. You can never go wrong by buying this brand. The good news about this 12 piece kit is that you already have the necessary products to keep both your car’s exterior and interior clean and it also includes the necessary accessories you may need. When you reach the auto shop and you’re looking for a simple cleaner to use on your auto, you’d be surprised just how many types of specialized cleaners there are. There’s one for bugs, for tars, for vinyl, and so much more. It can get really confusing super fast. Good thing this product exists! It isn’t called a super cleaner just for anything. This versatile product can remove dirt and grime from multiple surfaces, whether they are built for exterior and interior surfaces. So you can use just one product for leather, plastic, canvas, rubber, metal, trims and a lot more kinds of contaminants. You also have a more economical advantage since you won’t be needing cabinets full of auto-products. Just remember that it also has its limitations so don’t use it on glass and delicate panel screens. Some of you may ask why there’s a need to buy a specifically branded towel when there are lots of money-saving microfiber bundles available. Well, this is simply because the X2000 water magnet can help make your detailing project a whole lot easier. 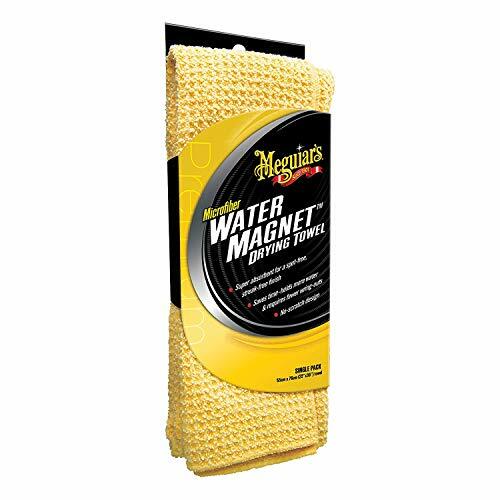 Since it’s created particularly as an automobile accessory, it was designed to function better than your normal kitchen cloth. This super absorbent fabric dries two times faster than traditional ones so you’ll cut a lot of drying time during your washing process. With its large size as well, you can get a whole lot more area done quicker and more efficiently. See, you will need more than a great shampoo and wax to better your detailing process. It’s also recommended to make the effort of getting the right tools as well. Back to familiar grounds, this kit will give you a great advantage in making your ride’s exterior look sleek and shiny. With the use of the two clay bars included in this system, you can rub off minor scrapes and scratches from your car’s finish. You can also easily remove old wax from the surface so that you can work on a clean and bare slate. Plus, you can apply the amazing instant detailer included in the kit to give your coat the mirror-like clarity every car owner and enthusiast wants. Everyone looking at your deep, reflective surfaces would surely ask how you got them. This kit will guarantee you amazing results so as long as you follow the instructions. 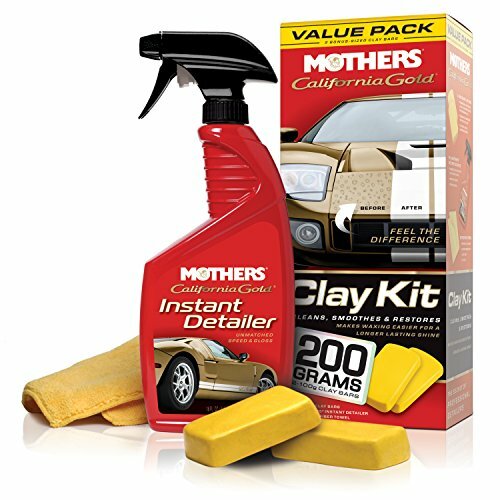 After all, Mothers is a brand that has become a huge favorite in the auto industry because of their amazing auto-care lines. One component in cleaning that many people miss is their glass. Windows and windshields should be considered more important to maintain than the car’s body. After all, that’s how you see through the traffic and keep safe. Therefore, using a product that’s created especially for glass cleaning is a must. A lot of surface cleaners would leave a white, hazy residue on your windows that will lessen their clarity. This set not only features a product that guarantees a residue-free formula, but also an amazingly innovative tool to apply this as well. Most people find it hard to clean their windshields because they can’t reach the middle area. The unique design of the reach and clean tool helps solve this problem and even cleans the nooks and crannies that towels can’t usually get to, as well. Wheels are designed in such a way that they can be hard to wash by using a towel. There are too many small areas that your hand can’t just reach. Plus, the rough surface can actually tear your towels more than it can wipe effectively. 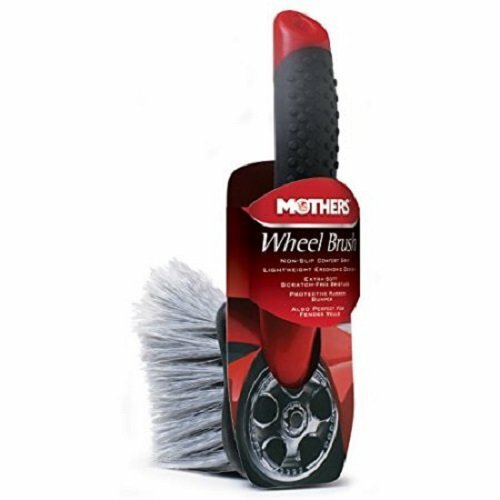 Mothers’ innovative wheel brush not only helps get to those hard to reach places but its fine bristles can more effectively clean tires as well. If you’re having doubts about the bristles scratching the rims of your tires, don’t worry. They may be very helpful in removing dirt and grime but they are also very soft so they won’t damage your rims in any way. Some people think that washing your vehicle with dishwashing soap and water are okay. After all, what’s not to like about saving more money by using one product for more purposes? Unfortunately, not many know that dishwashing soaps have abrasive qualities that can remove your car’s top coat and react badly with rubber. Using a special car shampoo like this one ensures that you not only wash your car but also keep your protective layer intact. This is especially important since you will need to wash more regularly than you need to wax. By using a specialized car shampoo, you can be sure that it will be gentle enough for all the car parts you need to be cleaned. To start the discussion, it might be best first to ask the question: What is auto detailing? It is the practice of cleaning the interior and exterior of your vehicle thoroughly, from top to bottom. This type of service is very different from a regular car wash whose function is to simply remove the dirt and grime from your car’s surface through soap and water. In fact, car washing is only a part of a complete detailing package. Applying wax to your paint, seat cleaning, window tinting, engine cleaning, and many more are other services that you can avail. Detailers are auto specialists that perform the detail services your car may require. Some detailers will have a more specific skillset than others and would more often than not offer services that highlight these. If you’re looking for a basic detailing job, there are many auto shops out there that have knowledgeable detailers that you can tap. If you’re in need of something more special like boat services or the like, take the time to research and scout for a good place to go to. Here’s a Youtube video from Detail Groove talking about tips from someone who actually does detailing already. When it comes to restoration and over-all treatment of your auto, automotive detailing is a great solution. Say goodbye to ugly scrapes and scratches as well as dusty seats and stuffy interiors. If you want to know how to detail a car, whether it’s because you want to try it for yourself or you just want to understand what the detailer would do, continue reading for a brief overview. 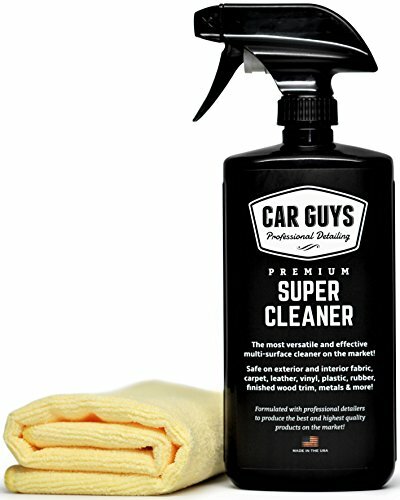 Many car owners will see the need to clean the outside of their cars. After all, this is where most of the ugly damage can be seen. Not a lot would think to clean the inside as well. This is an important step! Since you will be staying inside most of the time while using your car, it is highly hygienic to keep it sparkly clean. Dirt and residue left on the little details inside your ride can make you ill in the long run. Plus, it will keep you comfortable for longer as well! You can get rid of that ugly stain on your seats and breath clean air. What’s not to like? Basic interior services include having your upholstery and carpet scrubbed clean and conditioned. Don’t worry if it’s leather or fabric, detailers have special products to use for both. You can even ask for plastic and vinyl cleaning. Not only that but you can also avail cleaning services for the inside of your trunk. It’s also a good thing that you can also avail this package separately so that if you only need your interior detailed, you can do so! This is the service that a lot of car owners have no problem doing by themselves. However, the way they’re doing it is not as complete as most think. Although exterior detailing is the more known package of the two, many people only stop with the washing and waxing portion. That’s just the start! The first thing you need to be done on your car is car washing, be it a basic or pressure wash, to remove the contaminants stuck on the surface. The next step would be to take a compound, polish, or clay bar to remove stubborn scratches to make the coat clear. Lastly, you need to apply either carnauba or synthetic wax and buff it on the surface to lock in the gloss and add an extra layer of defense from harmful pollutants. Another service you need to get is tinting. Having your windows tinted will help lessen the damage that UV rays can inflict on the inside of your car, like a peeling dashboard or fading leather. It is also a good idea to ensure that your windshield and windows are adequately maintained since you’ll be looking out from there. Another safety measure you need to take is having your headlights cleaned to remove haze and make them light your way better. The headlight cover will decolorize due to constant heat from the sun. So, having it detailed will put a layer of protection on the covers, so it does not decolorize easily. You can also avail a full/complete detailing package which gives you all around car service for both the outside and inside of your car. You can even ask for a more advanced one by adding engine cleaning and detailing. If you want a more in-depth step by step tutorial on how to detail a car, head on over and read this article from DMV.org. 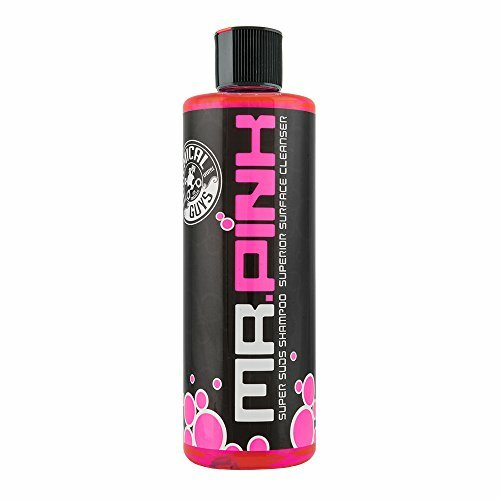 Among the many varieties of auto detailing, the most known and most common would probably be this one. As this service can be considered as the predecessor of all the others, it offers the most diverse of choices. Even the simplest step in the process, like wash services, have different options to choose from. You can either ask for a basic or premium wash, whichever you prefer. Even waxing can be customized to fit your specific needs. A beautiful hand wax job would give your ride an amazing gloss finish. But that’s not all car detailing can offer. You can ask for headlight restoration and trim cleaning services among many others. All the while, the inside of your car isn’t forgotten as well. All your vinyl and leather components will be cleaned and conditioned to shine. We have written a detailed article and explore more about car detailing in this post. Check it out! Let’s face it. A lot of time and effort needs to be sacrificed to get your ride super glossy and well-protected, and not a lot of car owners have that much time to spare. Even when there is extra time on your hands, you’d rather just stay at home and relax or go somewhere you can actually enjoy in. Going to the auto shop to have your car detailed may save you from going through the effort of doing it yourself, but waiting for the detailers to be done is hardly fun and cozy. But don’t worry! A mobile detailing service might just be the perfect solution for you. All you need to do is contact a shop that specializes in this, and house specialists will arrive in your garage to give you the clean auto you want. It’s like having your own personal auto shop for the day, and you won’t even need to step out of your house. This is one convenient auto package. Just check with car detailing shop near you and usually they will offer mobile or home service. Also, read this post if you are interested to learn more about how to start a mobile detailing business from home. This is another variation of detail package. An RV or Recreation Vehicle is a bigger and more complicated vehicle than your normal ride so there will be more steps involved in the cleaning and overall maintenance of it. Since it’s a complete motorhome, you will have additional components in the interior, mainly the kitchen, bathroom, and sleeping quarters. Aside from the regular washing and waxing detailing done on the outside, RV detailing will make your interior crystal clean. This means detailers will ensure that your space remains hygienic, comfortable, and livable. That is why it’s important to have your RV detailed regularly. Read this post if you are interested to learn more about RV detailing and where to find the best RV detailers near you. When it comes to quality automotive packages, having your engine cleaned and looked at is a top priority. This is one of the most important (if not the most important) parts of your vehicle since this is what makes it actually run. Ensuring the engine bay remains clean and looked after will help you and mechanics spot potential problems faster and more accurately. In turn, these auto-professionals can easily repair your car with no issues. By practicing regular engine detailing, you will save everyone a lot of time, effort, and money since the problem can easily be spotted and solved. Now, it is possible to do engine detailing by yourself if you know what you’re doing. Many articles on the internet can help you learn step by step but if you’re not 100% confident about doing this, then it’s better to leave it to the professionals. Making a big mistake can break your ride and having it fixed can be costly so it’s best to avoid that entirely. Learn more about engine detailing and how to take care of your car’s engine for long-lasting, here. Some people love marine activities and are inclined to have their own boats. That’s why this service exists, specifically to ensure that their boats remain top-notch. But because boats are a very particular type of vehicle, boat detailing isn’t a service that’s offered in a lot of places. To find out where you can go to have your boat detailed, it’s best to research in the immediate area, on the internet forums, and chat with people with the same interests as you. As a seafarer, it is essential to keep your boat detailed not just for the way it looks but for how it performs. A clean and waxed hull will allow for less resistance and smoother sailing. Clean vinyl seats will give you more comfort too. To learn more about boat detailing, read this post. Now that we know more about the different types of auto detailing services you can avail, the next important question to ask is: How much is car detailing? While it is most helpful if you were given an exact amount to compare to, it would be difficult as prices vary from location to location. Depending on where you live, auto detailing shops can either be scarce or abundant so prices can change in lieu of the demand for the services. You should also consider how much supplies cost in your area. The higher the prices for supply, the more expensive the service. The best way to determine how much you need to detail a car would be to ask your local shops for estimates. Don’t ask just one so you can compare the prices and pick the right one for you. If you’re lucky, the auto detailing shop you choose might even have a loyalty program which can give you discounts or freebies that you’re sure to appreciate in the future. How often you should schedule a detailing appointment for your car is highly dependent on how well you maintain your vehicle. If your ride is regularly washed and waxed, a full detail package can be done once every six months. That means you only need to avail this service twice a year. However, if your auto isn’t as well-maintained as it should be, getting your car detailed more regularly can prove beneficial to you. Once you get the level of maintenance you want, you can then limit it to the recommended twice a year. What is a Car Detailing Service? Just as a recap, a car detailing service is the thorough cleaning and restoration of your ride from top to bottom, in and out. This includes wash services like shampooing, waxing, tinting, dent removal, odor removal, and headlight restoration among many others. You can get your car detailed in any local auto shop near you. It is more common to have more than one shop in a neighborhood so you can even take a pick. To determine where to best have your ride serviced, ask around and talk to the detailers working in the shop. Get to know the detail package they have available and the corresponding prices. It’s also a good idea to ask for a specific estimate before choosing which one to go to. Or, you can go online and do a Google search for auto detailing shop near you. You will probably find a couple of detailing businesses listed on the map. Go through some of it and read the review left by their customers. Sometimes from the reviews, you can tell if the shop is a good pick or not. If you don’t like the idea of going out, leaving your car in a shop, and looking for a place to wait it out, you’re in luck. Mobile detailing services are widely available. To know more about the packages and mobile detailing prices they offer, just contact the company to inquire and set an appointment.